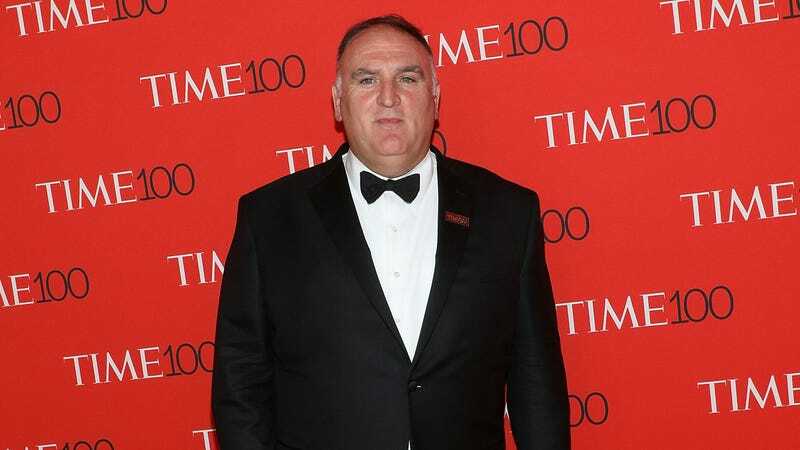 José Andrés opening emergency kitchen to feed federal workers in Washington, D.C. Chef José Andrés announced on Twitter last night that he will open a World Central Kitchen feeding site for furloughed government workers and their families on Pennsylvania Avenue, just down the street from the fanciest and most historical fast food drop-off site in the known world. World Central Kitchen is always there to respond to any disaster to make sure Americans and people around the world will not go one day without a plate of food. Today, we face another type of disaster emergency in the United States. More than 100,000 federal workers are without a job. Many millions of Americans are going to go through hard times. We believe that no person should have to go through the pain of not knowing what to feed their children. So we are opening a kitchen. Who&apos;s the man that unveiled the Puerto Rican flag at the Oscars? An American hero, that&apos;s who. WCK, the non-profit founded by Andrés after the 2010 earthquake in Haiti, serves communities in crisis around the world. Recent operations include service stations in Puerto Rico during the aftermath of Hurricane Maria, and during the 2017 Houston flooding crisis. Per the Washingtonian, those efforts fed thousands. The WCK site, which will be set up near U.S. Navy Memorial Plaza beginning Wednesday, will provide meals that can be eaten on site, as well as food to take home. It will operate from 11 a.m. to 6 p.m. The action is in addition to those taken by Andrés’ restaurants in the city, which have been offering free sandwiches to furloughed workers during the shutdown. You can support WCK’s ongoing efforts, including the kitchen in D.C. (#ChefsForFeds) and an operation feeding refugees in Tijuana (#ChefsForThePeople) by donating here.